We all know about cutting and pasting from one document to another. Hulu.com, the online video site set up by News Corp and NBC Universal last year, lets you do it with video: select the bit you want from, say, an episode of The Simpsons and email it to a friend, post it to your blog or put it on your Facebook page. Chopping up professional media at a user's whim is something that big media still has trouble getting its head around. But the one-click forwarding of bits of programmes is just one of the surprising tools that Hulu's management has been able to convince its two powerful media owners to embrace since the site had its "soft" launch last October in the US. Another is the search function. If a particular TV show or a film isn't one of the 400 TV series and 100 movies on the site, it doesn't give a "no results" message. Instead, it looks across the entire web to find legitimate (ie, non-pirated) video, and offers links to it - even if it sends users away from Hulu. So if someone searches for Desperate Housewives, a link will appear to abc.com - a rival network. "When we did this search feature initially, the people at Fox and NBC scratched their heads and said: 'Why are you doing that? 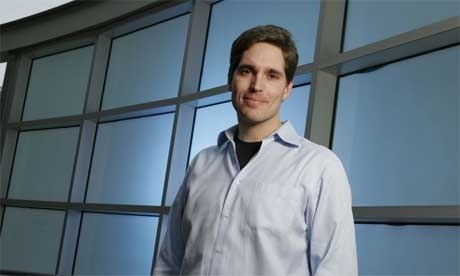 We compete with these companies in our traditional businesses'," recalls Jason Kilar, chief executive of Hulu. "But they quickly got to the conclusion that this is a great thing to do for users and so is exactly what Hulu is about and what Hulu aspires to be." What Hulu aspires to be is "the world's best monetisation service for premium content owners," says Kilar, who worked for Amazon for 10 years before joining Hulu as its first employee last July. "Everything at Hulu is monetised. We invest heavily in our advertising and sales operations and in the presentation of content because advertisers pay more for that." Thus the facility that allows users to cut and paste bits of programmes and email them or post them on other sites pays off because the video clips carry their Hulu-sold advertising with them wherever they end up. "This way we get content in front of audiences that we would never reach otherwise," Kilar says. Reaching audiences beyond Hulu is also why it is attracting CPM (cost per thousand) advertising rates above the rates paid for prime-time television slots. Kilar won't say how much advertising Hulu has taken, noting it is early days and that the site only launched officially on March 12. Kilar admits that part of the reason for the higher CPMs on Hulu has to do with a dearth of space: Hulu limits the amount of advertising time it sells to two minutes for every 22 minutes of video, a quarter of the typical eight minutes of ads per 22 minutes of video on American prime-time TV. "We think that this [amount of advertising] is the right user experience and the advertisers are also paying a premium for that," Kilar says. "We also don't autostart anything. So the advertising and the videos don't run unless the user has clicked to play." Kilar believes that providing a quality video experience means that the service is attracting an audience that advertisers covet, namely 18-to-34-year-olds. "They are very picky about the media they consume and how they spend their time," he says. Social networking may be the buzzword of the moment, but Kilar is very clear that Hulu does not want to stray too far on to ground that is already being covered by sites like MySpace, which of course is owned by Rupert Murdoch's News Corp, an investor in Hulu. "I think it would be a big mistake if we suddenly fashioned ourselves as a social network," says Kilar. "There are already social networks that are very good at what they do. We are trying to be the place you watch your favourite for free, anytime, anywhere. The widgets that we have on the site are in support of watching your favourites and the conversation around the content, but it's not about finding a soulmate or dating or commenting on pictures. There are places that do all that very well already." Kilar, who was recently in Cannes at the MIPTV trade show, says that he has ambitions to move beyond the US market with his service, but wants to avoid launching before he is ready. "We very much have ambitions to be a global site but we want to walk before we run," he says. "We would be very hesitant about launching in a territory without stellar content. In the US we took our time to make sure we had great content. We don't think that a service is built to last unless it is worthy of remark. And that will be our mantra." So far Kilar says the company has spent approximately $15m (£7.5m) to set itself up. He won't be drawn on the number of users of the service today, but admits that as the usage goes up the cost of running the business will increase because streaming video uses a lot of bandwidth - and that is expensive. "If you look at our cost structure, the personnel line is still our biggest cost but it will soon be eclipsed by bandwidth costs," he says. "But that is part of our business model." Kilar also thinks that Hulu ducked a bullet when it decided to opt for browser-based streaming of its content rather than basing it on peer-to-peer downloads like Joost. "I think streaming is a bigger market than downloads, and although I can't talk about future road maps, when you look at the free streaming business which is ad-supported versus the download business which is a transaction model, I think that streaming has more potential." He points to the success of the BBC's iPlayer. "I think the stats speak for themselves. In the US, consumption of television content over the net has more than tripled in the past 24 months. In other markets, I have no reason to believe that the growth wouldn't be as strong so long as the content is made available. People are embracing free, ad-supported premium content over the internet." Does he think Joost's teething problems will cripple its service? "I have so much respect for Mike Volpi [Joost's CEO]. He is one of the sharpest tools in the shed and I admire him personally and professionally, so I think that Joost is in very good hands with Mike Volpi." But, he adds: "Joost started at a different moment in time and when they were reading the tea leaves they came to certain conclusions. We [at Hulu] started a year and a half later and that made the difference. Individual companies that are focusing on aggregation now may go niche. These things happen. But in an industry as large as this [online video], I think there will be more than one winner." Kilar "gives credit" to NBC and Fox for letting Hulu develop in ways that seem antithetical to a traditional media business accustomed to controlling exactly how and when its programmes are viewed. "It's our job to focus on the mission and if we do that the folks at Fox and NBC will continue to keep whatever they do outside our boardroom to compete with each other aside so that we can build this much larger thing together," he says. "Because that is what it is all about: aggregating on the net is a lot more valuable than not aggregating. It is the difference between having a store that sells one record label as opposed to one that sells many, many labels." · CEO Jason Kilar was the first employee, hired in July last year. · The company was co-founded by News Corp and NBC Universal, but in August Providence Equity partners paid $100m (£50m) for a 10% stake, valuing the business before launch at $1bn. · Some $15m has been invested so far, according to the company. · Hulu.com has content agreements with 50 providers, including MGM and NBC Universal. · Hulu.com streams all its content and began offering HD content in March.